Unless you were an obsessive record collector back in the day, and you're like me, wasn't even alive back in the day, you first encounter with Peter Bardens would have been with Camel. That's what happened to me, after all I bought my first Camel album (used LP) The Snow Goose in 1994. So obviously I bought a bunch of other Camel albums, and did try his two late '80s solo albums, Seen One Earth and Speed of Light, the latter just not that good, the first isn't too bad, but the '80s production and synths do distract. I also realized he released two albums prior to Camel, The Answer and self-entitled album (the self-entitled was known in the States as Write My Name in the Dust). I finally got me an early solo album, The Answer, that I found at a flea market in Eugene, Oregon. I couldn't believe I would find a copy there, but there you go! The American copy features a totally different cover from that of the British pressing. 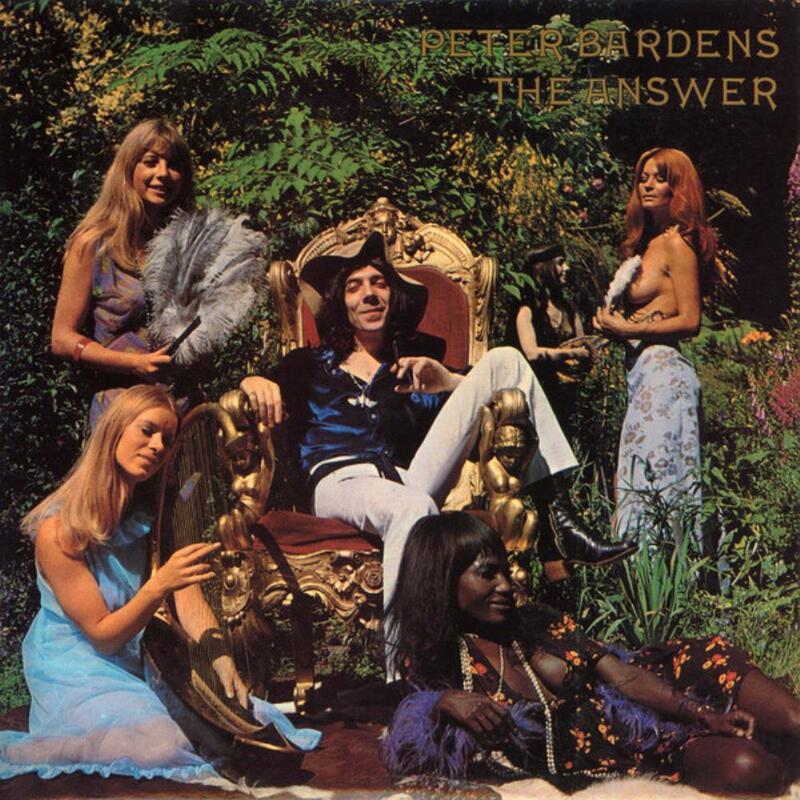 It had more of a '60s psychedelic look with Peter Bardens' face on the cover, while the UK version is just a photo of him with a bunch of ladies. What may throw off a lot of progheads with this album is they expect it to be just like Camel, but what they really get is a more eclectic selection of psychedelic, blues, and crossover prog. Listening to Camel, it's hard to believe he was part of the British blues boom, having been a member of Shotgun Express that also featured Peter Green and Mick Fleetwood. He was also in Them with Van Morrison (explaining his appearance on the latter's Wavelength album just as he was ready to leave Camel), so prior to Camel, he really didn't have prog credentials. Anyways, The Answer starts with the title track and probably the most proggy thing on the album. Not symphonic, but clearly crossover prog here, having a rather nice piano and organ theme, and some nice vocals to go with it. The next two songs tends more towards the blues, where "I Can't Remember". I knew "Homage to the God of Light" from a version done by Camel on a CD called On the Road 1972, which shows how Camel performed this one live in their early days (also demonstrates how material for Mirage had been with the band even before their debut ever appeared). This original features vocals and really goes off the wall with extended guitar and organ jams. It frequently goes into Santana mode, but Carlos Santana's guitar playing would be more restrained than Andy Gee's. Andy Gee, by the way, is a real guitarist, a German-born guitarist, and not Peter Green in disguise as sometimes believed (Green probably did appear on the album, but uncredited). To me, this album really blew me away, but I seriously doubt the prog purist would have lots to enjoy, but it to me, the music reviews are on the quality, not how much or not prog it is. Great stuff, as far as I'm concerned.